Archive by category "School Transition"
It’s an important week for our kids and we want to help you through these days of big transitions! Know that it’s normal for there to be tears and fears and for the transition to be less than smooth, especially for younger children starting school for the first time. Everything from separation anxiety to changes in routine can feel scary and disruptive. Each child is different. Some children handle transitions with wide open enthusiasm. Others are cautious but compliant. And some little ones may have an emotional meltdown. 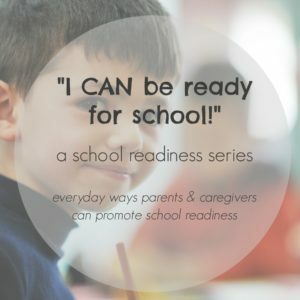 School readiness can feel overwhelming. But we hope you’re beginning to see that school readiness and life readiness go hand in hand! Loving your kids by providing a safe home, keeping them healthy, reading together, and establishing simple routines are all part of a school readiness foundation. Involvement in the lives of young children in your community, through your church or neighborhood, is another building block in the readiness foundation. We hope your kids have gotten off to a good start this week! If there have been tears and fears, know that it’s normal for the transition to be less than smooth, especially for younger children starting school for the first time. Everything from separation anxiety to changes in routine can feel very disruptive. Each child is different. Some children handle transitions with wide-open enthusiasm. Others are cautious but compliant. Still others may have an emotional meltdown.